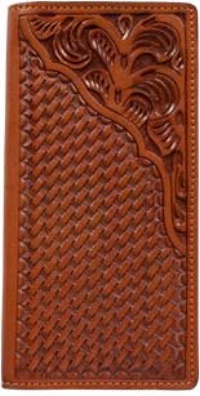 3D Belt Company Tan Rodeo Wallet with Fancy Floral Embossed Leather Trim and Basketweave Embossed Leather body. Inside Features include 6 plastic credit card sleeves, several leather credit card slots, identification window and the normal opening for cash. 3D Belts offers quality products at fair prices. Please Allow 10 to 14 days on some items. Inside Features include 6 plastic credit card sleeves, several leather credit card slots, identification window and the normal opening for cash.